UPTab USB-C (Type C) to 10/100/1000 Ethernet Gigabit LAN Network Adapter (Thunderbolt 3 Port Compatible) by UPTab at Pacs BG. MPN: UP-TC1GBRJ45-AMZ. Hurry! Limited time offer. Offer valid only while supplies last. 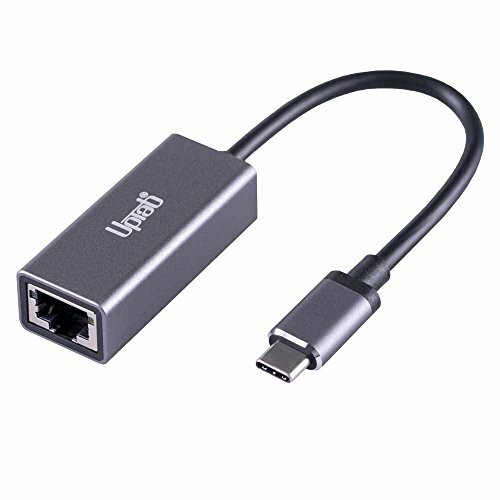 Immediate Network ExpansionThe UPTab USB Type-C to Gigabit Ethernet Adapter is the ideal solution for connecting a computer without an Ethernet port. Compatible Examples: 2015/16 MacBook, 2016 Macbook Pro, Dell Latitude 12 7275 / 13 7370 / Precision 15 5510 / 15 7510 / 17 7710 / XPS 12 9260 / XPS 13 9350 / 9360 / XPS 13 2-in-1 9365 / XPS 15 9550 / 9560 , Alienware 13 / 15 / 17, Razor Blade Pro/Stealth, Acer Aspire V Nitro / Switch Alpha 12, Lenovo Yoga 900 / 910. The UPTab USB Type-C to Gigabit Ethernet Adapter is the ideal solution for connecting a computer without an 10/100/1000 Ethernet port. Instantly add network connectivity to a computer with USB-C for extremely fast and secure file transfers or streaming downloads. Auto sensing USB adapter supports any 10/100/1000 Ethernet network. Thunderbolt 3 equipped computers use the slim, reversible USB-C connector. If you have any questions about this product by UPTab, contact us by completing and submitting the form below. If you are looking for a specif part number, please include it with your message.